According to Norman Vincent Peale, to be successful, I have to be Christian. In his introduction, Peale asserts, "This book teaches applied Christianity; a simple yet scientific system...."
Do I need to go on? Well, I think I do, because his book, The Power of Positive Thinking, is one of those books we’ve all heard of, even if we haven't read it. Published after Dale Carnegie’s seminal tracts and before the 1960s and 1970s EST-y feel good type books like I’m Okay, You’re Okay and Feeling Good, The New Mood Therapy, it contains a lot of stuff that has filtered into the contemporary consciousness. If reading it wasn’t like continually running into a wall, it might be more helpful. Some of the stuff he writes, minus the overt religiousity, is right at home in a Cognitive Behavioral Therapy session. There are exercises for “emptying the mind” of worry, and instructions in replacing negative thoughts with positive ones. There are visualizations of desired outcomes that any elite athlete might use to rev up for the next big event. But then there’s a lot about turning over your anxieties to God, to putting yourself in God’s hands, and to remove any doubt about this god, there are specific Bible quotations from the New Testament to use as daily affirmations. Sure, the Psalms are mentioned, especially the 23rd Psalm; but I’m not sure anyone remembers that the Psalms were part of the Tanakh, or Holy Scriptures, the Bible of Jews, as even this secular Jew knows. The term “Old Testament” trips easily enough from my fingers, and would have been a lot less wordy than the previous description; but is it perverse to remind my tens of readers that to refer to the literature that a particular religion other than Christianity regards as its spiritual foundation in this way is to reinforce the Christian-centric nature of our world? 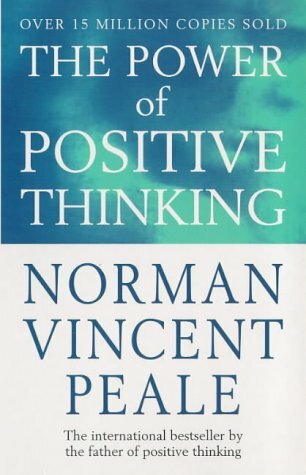 Reading Norman Vincent Peale felt a bit like attending Cathedral services at my Episcopal prep school. Whenever I came across a tidbit that rang true, I was quickly thereafter reminded that it really didn’t apply to me, the Godless infidel. It’s okay. My parents paid for my schooling, and they didn’t have to. I got an excellent education at my Episcopal prep school, and I don’t resent it at all. It’s important to understand the bias of the society, even in its most well-intentioned. Ecumenical means welcoming to all religions, as long as they’re subsets of Christainity or can be placed within that context. This is the way the world works in our neck of the woods. We poor godless folks can expect at best some pity from the Dominionists trying to overthrow our government and turn it into a theocracy. At worst? Well, I’ve learned a few tricks from Norman Vincent Peale.